There is beauty everywhere in our world --from the smallest mouse to a powerful waterfall. See the beauty where you live. Have you ever listened to a podcast? A podcast is like a talk radio show. Brains On! is a podcast featuring science and kids produced by MPR News and Southern California Public Radio. They ask questions and go wherever the answers take them. Sometimes that means talking to a food scientist or a snake handler, other times that means putting on a play about sound waves or writing songs about sleep. A different kid co-hosts each episode. It’s a science lesson for your ears – so join us and turn your brains on! 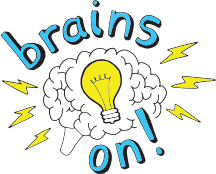 The Brains-On website lists many of their podcasts. Check out a few! ​Creative people use ALL their senses to learn. Hearing is not the same thing as "listening." LISTEN and learn.